Unboxed the ETX. Well, that's not really accurate. This is not new. It is the ETX 90 that Charles owns. He gave it to me at a RASC gastronomical meeting to try out. Had some time, finally, to explore. I found a finger print on corrector glass. Worse. The secondary mirror is moving! It looks like Meade glued the secondary to the back of the corrector lens. But over the years, the secondary has drifted... I shot a photo. Wild. It is so crude. To install the batteries, you must remove the bottom metal plate. All the electronics are exposed. They built this quick and fast. The bottom plate is thick metal . Clearly to serve as ballast. Oops. Loaded the AA batteries the wrong way. Unlike most devices, they do not alternate polarity... Be careful what you assume. This is kinda cool though. 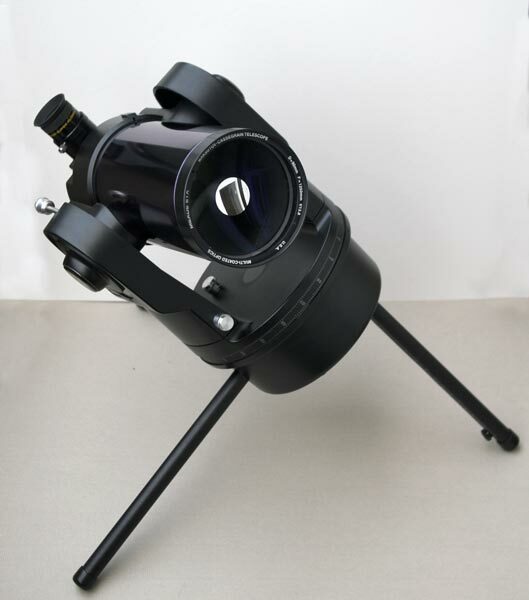 Unlike the Questar, this 'scope is completely portable. You just need AA batteries. Still, immediately, I thought: how about an external power source?! My universal adapters would work. I have the CLA input units (two, actually; one already with the Vixen). And I have the general AC adapters (a couple; one for the Psion in the office; one for the Psion in the bedroom). Now, should the RA clutch be fully engaged or not? It's making a noise... a soft clunk. But, with the clutch tightened, I think it is working. Image copyright by Thomas Gade of Berlin.